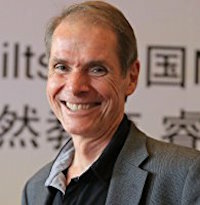 Robert B. Dilts, founder of Dilts Strategy Group has had a global reputation as a leading coach, behavioral skills trainer and business consultant since the late 1970s. Robert has been a developer, author, trainer and consultant in the field of Neuro-Linguistic Programming (NLP) - a model of human behavior, learning and communication - since its creation in 1975 by John Grinder and Richard Bandler. and has provided coaching, consulting and training throughout the world to a wide variety of individuals and organizations. In May, 2018, Robert was honored with the Lifetime Contribution Award by the Association for Neuro- Linguistic Programming (ANLP). Robert is a co-developer (with his brother John Dilts) of the Success Factor Modeling™ process, a method to identify and transfer the critical success factors necessary to promote effective entrepreneurial activities within both new and traditional companies, by analyzing crucial patterns of business practices and behavioral skills used by successful individuals, teams and companies. They founded Dilts Strategy Group in order to apply the Success Factor Modeling™ process to support companies' growth and development on many levels. DSG's services include: modeling, training, consulting, coaching and hosting seminars in the application of the Success Factor Modeling™ process to groups and organizations throughout the world. Robert has authored numerous books and articles about Success Factor Modeling™, including Next Generation Entrepreneurship: Success Factor Modeling Volume I, Generative Collaboration: Success Factor Modeling Volume II and Conscious Leadership and Resilience: Success Factor Modeling Volume III. His book Visionary Leadership Skills draws from Robert's extensive study of historical and corporate leaders to present the tools and skills necessary for "creating a world to which people want to belong." Robert's book Alpha Leadership: Tools for Business Leaders Who Want More From Life (with Ann Deering and Julian Russell) describes a new model of leadership that captures and shares the latest practices of effective leadership, offering approaches to reduce stress and to promote satisfaction. From Coach to Awakener provides a road map and set of toolboxes for coaches to help clients reach goals on a number of different levels of learning and change. Robert's book The Hero's Journey: A Voyage of Self Discovery (co-authored with Stephen Gilligan) demonstrates how to embark on a path of learning and transformation that will reconnect you with your deepest calling, transform limiting beliefs and habits and improve self-image. For a complete list of Robert's publications click here. For the archive of Robert's on-line articles click here. Past sponsors and clients include Apple Inc., Microsoft, Hewlett-Packard, IBM, The World Bank, Alitalia, Telecom Italia, RAI Italia, Lucasfilms Ltd., Ernst & Young, AT Kearney, Salomon, The Bank of America, The Old Mutual, Société Générale, EDHEC Business School, The American Society for Training and Development, The International Planned Parenthood Federation, Sanofi Aventis, The University of Miami School of Medicine, and all of the major NLP institutes. He has lectured extensively on NLP, making presentations and keynote addresses for The European Forum for Quality Management, The United Nations, The World Health Organization, Harvard University, The International University of Monaco, The Organization of Women Leaders, The California Association of Special Education Teachers, The University of San Francisco School of Law, The Milton H. Erickson Foundation, The International Coaching Federation (ICF), HEC Paris and The National Tumor Institute of Italy. In 1997 and 1998, Robert supervised the design of Tools for Living, the behavior management portion of the program used by Weight Watcher's International. Robert was an associate professor at the ISVOR Fiat School of Management for more than fifteen years, helping to develop programs on leadership, innovation, values and systemic thinking. From 2001–2004 he served as chief scientist and Chairman of the Board for ISVOR DILTS Leadership Systems, a joint venture with ISVOR Fiat (the corporate university of the Fiat Group) that delivered a wide range of innovative leadership development programs to large corporations on a global scale. Robert is also co-founder, with Dr. Stephen Gilligan, of the International Association for Generative Change (IAGC). The purpose of the IAGC is to bring principles of generative change to multiple professions throughout the world. The IAGC offers training, certification and other resources that promote generative change in personal, professional and organizational contexts. Robert was also founder and CEO of Behavioral Engineering, a computer software company using NLP concepts to create interactive computer products for education, training and personal development. Robert has a degree in Behavioral Technology from the University of California at Santa Cruz. He received the President's Undergraduate Fellowship in 1977 for research correlating eye movement and brain function conducted at the Langley Porter Neuropsychiatric Institute in San Francisco.